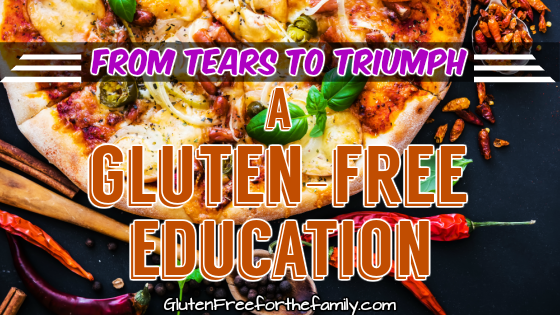 Gluten-Free Dining – From Tears to Triumph! I ordered a gluten-free pizza with oil and garlic sauce, gourmet veggies, bacon and no cheese of any kind. After giving my order and then having the person repeat my order back to me no less than 3 times, I was confident that all would be well. I picked up my pizza, went home and popped my goat cheese on it, and placed it in the oven for dinner. I began to notice that the crust looked different! It was fluffy, which was odd. I called the restaurant and told them that I wasn’t so sure it was Gluten-Free, and I asked them to check with the person who actually made my pizza. A manager then answers and says that there was no gluten-free crust on the order! Okay, needless to say I was extremely upset. I shared with the manager that I had the person taking the order repeat it to me no less than 3 times. She was sympathetic, but the only thing that she could do was make me another pizza. I took a deep breath and said, “OK.” I’ll be there shortly. I show up at the restaurant, and they seemed near to closing for the night. The containers that hold the ingredients were on the counters as if they were being cleaned. The manager there looked at me as if she was a deer in the headlights. They hadn’t made my pizza, and she was scrambling to have someone do it. I watched as the guy making my pizza set the crust right next to a GLUTEN pizza calzone (the ones with crust on top and bottom—a lot of gluten!). I said, “Is that where you are making my pizza?” He said, “Yes, I suppose we could wipe off the counter.” Oh my freaking gosh! Seriously! I was so upset that I yelled, “Never mind!” I turned and stormed out! Totally frustrated- I had cereal for dinner. The next morning, I called Papa Murphy’s hoping to talk to a manager. I actually got the franchise owner on the phone – perfect! I said, “I suppose you heard about my issue last night; I’m the one with the gluten-free crust issue.” I actually heard surprise and genuine interest in his voice, and he wanted to know my story. I went through the events of the night before. I told him that I had a website, glutenfreeforthefamily.com, and was very disappointed that I may have to cross their restaurant off my list of safe eating places. He was extremely interested. He related that although he personally did not have any problem with gluten, he had family members that were gluten intolerant, and it was his passion that people could eat safely at his place. I explained that when you have Celiac Disease, less than 1/8 tsp of gluten can cause a person to be sick. Also, cross contamination is a huge issue. He didn’t realize any of that UNTIL I told him! He was so grateful that I had called him, and he actually asked me if I would come and give a safety training session to his staff. I accepted immediately and am extremely happy with the end of this story. Not only do I finally get my pizza correct, I get to help this restaurant serve food safely so no one will get sick! A Win Win! WOOHOO!